Our catapult is inspired by early designs. It is powered by a powerful twisted rope skien, and features a simple spoon and arm type arrangement. Each piece has been accurately machined from carefully chosen lumber, and precisely drilled to allow easy assembly. Detailed, clearly illustrated assembly instructions guide the builder through each step of construction. The completed model measures 20.3cm(8″) x 10.1cm(4″) x 15.2cm(6″). A how-to section demonstrates loading and firing the completed catapult, including tips on tuning the finished kit. We manufacture all of our products locally without the use of lead. This kit is simple to load and fire, and uses lightweight hurling stones to prevent injury. From the time of the ancient Greeks and Romans up through medieval times catapults were used to gain a tactical advantage on the battlefield. 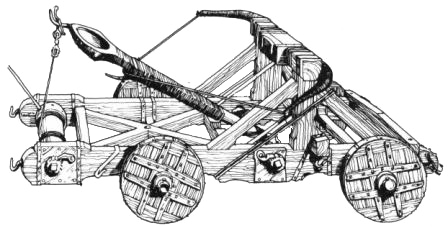 The simplest form of the weapon was the onager or mangonel, where a projectile was placed in a cup or spoon on the end of a throwing arm. The arm would be powered by twisted ropes of hair or fibre. When fired, the arm would swing up and slam into a stopping block, causing the entire catapult to buck, and sending the payload on its way.